Are y’all ready for pumpkin explosion in bloggyland?! 🎃 You know it’s coming, right?! 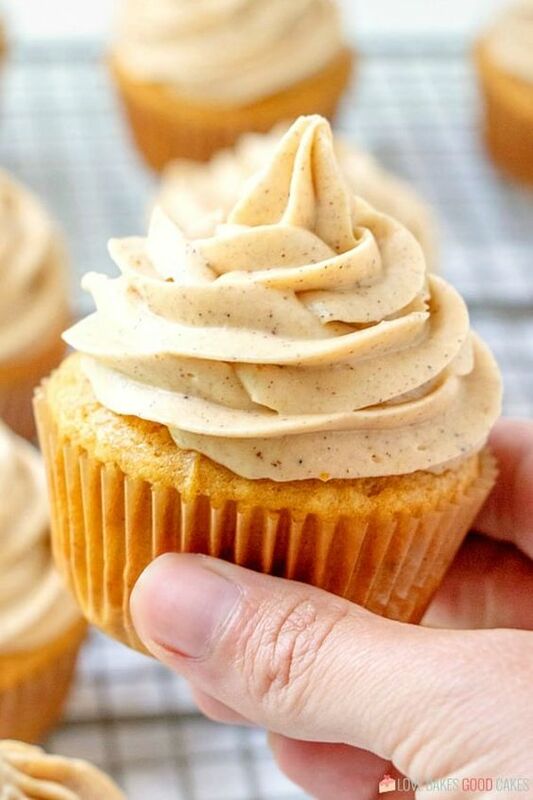 I have to admit that I will have to do my part to infiltrate the internet with all things pumpkin … and these Pumpkin Cupcakes with Pumpkin Spice Cream Cheese Frosting are the perfect way to start the Fall baking season! They are full of pumpkin flavor … and oh, so good!! Preheat oven to 375°F. Line a muffin tin with cupcake papers (24 cavities) and set aside. In a medium bowl, combine the flour, baking powder, baking soda, salt, cinnamon, ginger, and nutmeg. In a separate medium bowl, cream the butter and sugar until light and fluffy. Beat in the eggs until thoroughly combined. Add the pumpkin and combine. Stir in the dry ingredients alternately with the milk, blending until the mixture is smooth after each addition. Divide the batter between the prepared muffin cups, filling about two-thirds full. Bake for 23-25 minutes or until a wooden toothpick inserted near the center of one of the cupcakes tests clean. Remove cupcakes to a wire rack to cool completely. Beat the cream cheese, butter, and pumpkin in a large bowl until thoroughly combined and fluffy. Add the powdered sugar, vanilla, cinnamon, ginger, and nutmeg. Beat until smooth. Scrape down the sides of the bowl at least once to make sure all ingredients are incorporated. Frost cupcakes. 0 Response to "PUMPKIN CUPCAKES WITH PUMPKIN SPICE CREAM CHEESE FROSTING"